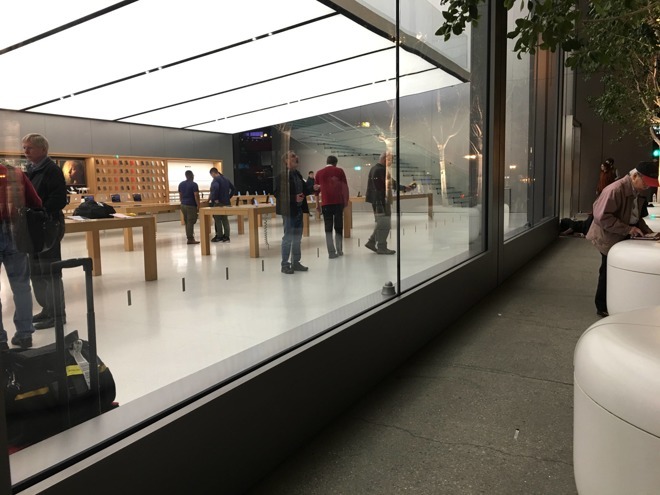 At least some Apple stores across the U.S. —including its Union Square outlet in San Francisco —reportedly set up line barriers on Wednesday night, and/or saw unusual activity behind their glass facades. At the Union Square store, the barriers were accompanied by contractors making laser measurements and pointing to the building's glass doors, one Reddit commentor noted. When asked, one of the contractors allegedly said "sorry, can't say anything" with a grin. Some bags in the building are said to have "SFO" airline tags on them, implying that people had just flown in. Similar activity was spotted at other Apple stores in Hawaii and Indianapolis, according to follow-up posts. It's not clear what the activity might mean. Line barriers could imply Apple is expecting to launch an important new product following Thursday's Mac event, but Mac launches aren't typically blockbusters, and the company tends not to have a new product in stores the same day as a press event. Perhaps more likely is that the company is preparing to install new product displays, though if so, that may not explain the barriers. The focus of today's event —starting at 10 a.m. Pacific time —is expected to be redesigned MacBook Pros, including OLED touchbars and Touch ID sensors. The company may also show off a 13-inch MacBook or MacBook Air, however, and new Apple TV software, including a guide/recommendation app and delayed single sign-on support. AppleInsider will be live at the event to provide play-by-play coverage.